Competition is intense in the Canadian hiring market for skilled accounting and finance professionals. Employers and hiring managers have their work cut out for them as they come up against more and more top candidates receiving multiple job offers. We've come up with five tips to help you navigate the rough waters of hiring and negotiating salary amid the challenges of multiple job offers. Companies are willing to pay a premium for top talent today. Almost three quarters (72 per cent) of the CFOs interviewed for a Robert Half survey said they increased new hires' starting salaries from what they made in their previous job, with an average increase of 5 per cent. Unlike fixed aspects of the hiring offer, such as basic health benefits, the market sets the going salary rate for a specific position. That’s why salary negotiation will always be a factor when recruiting coveted finance and accounting professionals. To make sure you’re keeping pace with the competition, prepare for salary negotiation by benchmarking your salaries with those of other firms. Visit Robert Half's Salary Centre for the latest in Canadian hiring trends and up-to-date salary data for more than 175 accounting and finance positions. Adjust salaries for jobs in your city with the Salary Calculator, and get your own copy of the Salary Guide. While health and dental coverage are important, they aren’t the only perks for employees. Today’s candidates, especially those with multiple job offers, are also interested in vacation days, paid time off, flexible work arrangements and RRSP packages. The value assigned to each of these factors will vary depending on the job seeker. If you can gauge a candidate’s interests and are willing to meet his or her needs, you’ll have a better shot of sealing the deal. Did you know that more CFOs are more willing to offer extra incentives than they were several years ago? Read our study on negotiating perks so you can keep up with the competition. What do you have to offer that the competition doesn’t? Here is where you promote your company culture — what makes working for you unique. Maybe it’s the option to telecommute, the collaborative office culture, out-of-town retreats or even the end-of-the-week happy hours for members of your team. After learning about candidates’ advancement aspirations, explain how they would play a role in the organization’s future and what career advancement or professional development opportunities you offer. Learn more about the importance of offering work-life balance in your workplace. You've heard the saying that timing is everything, and for firms trying to hire, timely decisions could make the difference between securing the candidate and losing out to multiple job offers. A Robert Half survey shows that more than six in ten Canadian workers (64 per cent), the most frustrating part of the job search is the long wait after an interview to hear if they got the job. 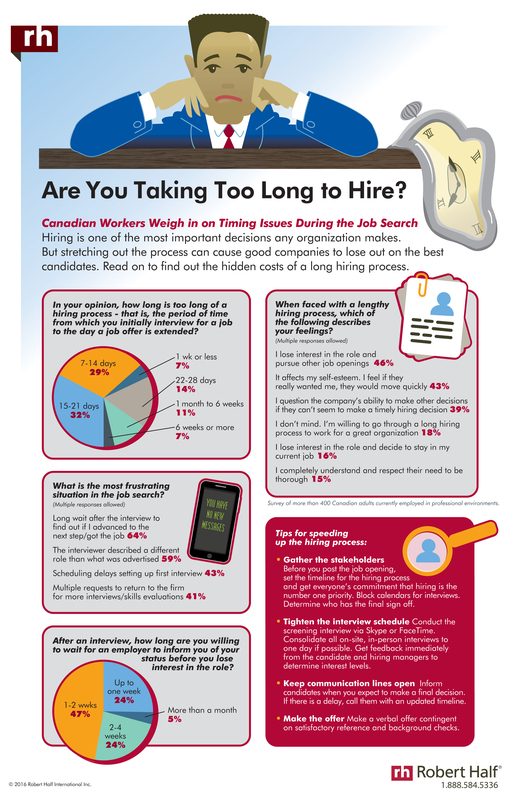 View this infographic and ask yourself if you're taking too long to hire. In a recent Robert Half survey, 50 per cent of Canadian CFOs reported they typically post an open job and wait for resumes; only 6 per cent actively recruit beyond sifting through incoming applications. Yet when employed workers were asked if they would consider a job offer from a recruiter, most (64 per cent) said yes. The leading recruiters can provide valuable insight for you in your hiring, because they are in constant communication with job seekers — both active and passive — and employers. They know the current employment trends and have large networks of skilled professionals to meet your hiring needs. Find out more about working with our recruiters. One last tip: When confronted with potential hires who have received multiple job offers, don’t hesitate to ask what would convince them to accept your offer. If they're frank with you about what they want, you'll have the opportunity to present concrete information to make the prospect of joining your company more appealing.